SEARCA's Graduate Study Program was initiated in School Year 1968/1969. Over four decades, the scope of the Graduate Study Program has expanded to include institutional development, networking, and services to enhance graduate education in the region. SEARCA has also been providing services for administration of scholarship funds under the sponsorship of institutions other than SEAMEO. 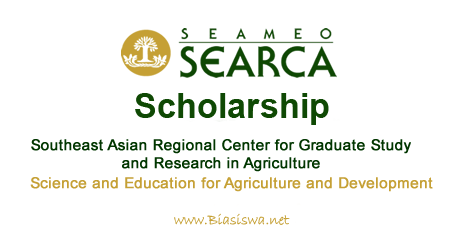 At the start of Academic Year 2017-2018 SEARCA has granted a total of 1,633 scholarships to Southeast Asian nationals. Open to nationals of SEAMEO member countries who are regular employees of academic or research institutions or government agencies. Must not be more than 35 (Master's Degree) or 40 (PhD) years of age at the time of application. Moreover, priority research topics must fall within the ISARD strategic thrusts on social inclusion, environmental sustainability, and cross-cutting concerns. Covers tuition and other school fees; travel allowance (roundtrip air ticket from home country to study post and local transportation); thesis/dissertation support; book and supplies allowance; health insurance; and a stipend for food, lodging and incidental expenses. The Ministry where the applicant is employed may conduct preliminary screening of applicants and submit their nominations and the application documents to the Ministry of Education/Higher Education, which will then include the nominees of other Ministries in the final list of candidates to be submitted to SEARCA. The other Ministries may opt to just receive applications and forward these, without preliminary screening, to the Ministry of Education/Higher Education. Alternatively, applications may be submitted directly to the Ministry of Education/Higher Education. Application forms and information brochures on the universities that may serve as study posts of SEARCA scholars are available at these Ministries and may be downloaded from here. 5. Brief description of the research the applicant plans to conduct for thesis/dissertation. The research topic must be in line with the thrusts of SEARCA's Tenth Five-Year Plan i.e., social equity, environmental integrity and regional economic integration by promoting food and nutrition security; value chains and agribusiness commodity systems; innovations and modern technologies; rural entrepreneurship; climate change adaptation and resiliency, natural resource management; sub-regional cooperation in trade and investments; and government policies/reforms that address rural poverty, inequitable growth, and environmental degradation. The Plan will be made available at http://www.searca.org. 10. Results of Test of English as a Foreign Language (TOEFL): score of 550 for paper-based and 213 for computer-based) or IELTS results (6.0). The TOEFL results must be issued by Princeton, New Jersey, USA. Check the schedule and venue of TOEFL tests in your country at http://www.ets.org/toefl/. Deadline for the Ministries to send endorsements to SEARCA is 31 July of every year. Applicants are thus requested to check from their respective Ministries of Education/Higher Education for their deadline of receiving applications.